Latest Update on 15th Nov 2018: Check Individual District wise SSA Websites for Recruitment Notification Details. The Andhra Pradesh Government is all set to release a Notification for recruitment of 2,379 Sarva Shiksha Abhiyan posts in the State. These vacancies will be filled as outsourcing Jobs. The Recruitment Process will be Completed by 10th November 2018. 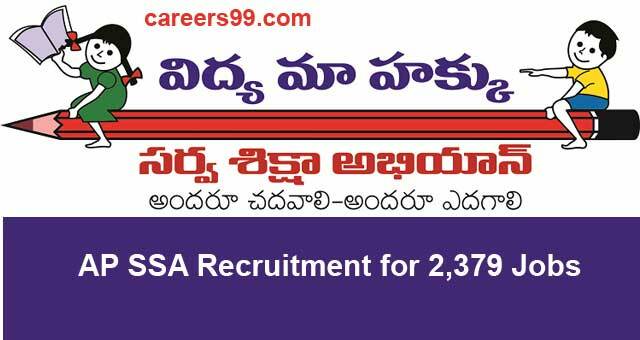 Sarva Shiksha Abhiyan Andhra Pradesh (SSA AP) is going to release Notification for the posts of Teaching & Non-Teaching having 2379 vacancies on its official website ssa.ap.gov.in. Interested and eligible candidates can Apply Online before the Last Date i.e., Update Soon. Required details like educational qualification, age limit, Selection process of SSA AP Notification 2018-19 are given below. Out of total 2,379 posts, around 1,929 are teaching posts and 450 non-teaching posts. The candidates for teaching posts will be shortlisted based on a written test that will be conducted for 100 Marks. Candidates for non-teaching posts will be recruited by the SSA-appointed agencies supervised by the District Collector. The candidates who are willing to apply for the post are advised to visit the official website – ssa.ap.gov.in/SSA/ – to check more details and apply for the posts. Candidates age should not exceed 39 Years as on 1st July 2018. For SC, ST, BC candidates the upper Age limit is 44 Years. For PH candidates it is 49 Years. Eligible and Interested Aspirants are requested to Download Application Form from Below link of ssa.ap.gov.in Website and Submit it to the mentioned Address before the Last Date i.e., Update Soon. First of all, Open Official Website i.e., ssa.ap.gov.in or Below Mentioned link from careers99.com Website. Sarva Shiksha Abhiyan (SSA) is Government of India’s flagship programme for achievement of Universalization of Elementary Education (UEE) in a time bound manner, as mandated by 86th amendment to the Constitution of India making free and compulsory Education to the Children of 6-14 years age group, a Fundamental Right. SSA is being implemented in partnership with State Governments to cover the entire country and address the needs of 192 million children in 1.1 million habitations. The programme seeks to open new schools in those habitations which do not have schooling facilities and strengthen existing school infrastructure through provision of additional class rooms, toilets, drinking water, maintenance grant and school improvement grants. Existing schools with inadequate teacher strength are provided with additional teachers, while the capacity of existing teachers is being strengthened by extensive training, grants for developing teaching-learning materials and strengthening of the academic support structure at a cluster, block and district level. SSA seeks to provide quality elementary education including life skills. SSA has a special focus on girl’s education and children with special needs. SSA also seeks to provide computer education to bridge the digital divide.